LogiLink®'s Cat5E shielded patch cables are built for ease of use and peak signal quality. The molded boot serves as a strain relief, while eliminating cable snags. Our Cat5E patch cables are optimized for all Fast and Gigabit Ethernet performance and conform to current industry standards like TIA/EIA 578A and T578B wiring specifications. LogiLink®'s Cat5E Shielded Patch Cord is comprised of four 26 AWG diameter foil shielded twisted pairs of solid wires. We have Cat5E patch cords available in many different lengths and colors. 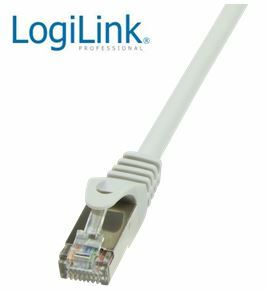 LogiLinks CAT6 Economic Line patch cables are ready for your high speed network up to Gigabit Ethernet. We have the EconLine CAT6 Ethernet patch cables of many different lengths and colors. Since CAT6 Ethernet components are backward-compatible with older network equipment (including Cat3, Cat5 and Cat5E), LogiLink CAT6 patch cables and cords integrate legacy components such as printers and computers.